Summary: A building permit allows you to build your house and a land survey assures correct placement of your home. The cost of building permits and fees can vary tremendously by locale. Building permits not only allow you to build, they help assure you that your new home will be built according to local and state building codes. Most home builders allow 1.5% of the total cost of labor and materials for the simple permitting process for just the house and garage alone. But 1.5% may not be enough. Note: Investigate all the costs of all permits and fees with your local building inspection department as soon as you start thinking about building! Other permits for such activities as well installation, septic systems, electrical wiring, plumbing, HVAC, driveways, etc. are obtained by, and paid for by each relevant contractor and the cost of these required permits are included in each contractor’s bid or contract price and will be in their name. Many locales, especially those in densely populated and/or affluent areas have added impact fees on top of construction permits. These impact fees are paid at the time you obtain your home building permit. Impact fees can be for local schools, traffic mitigation, parks mitigation, affordable housing, green building requirements, etc. The costs of these fees can be prohibitive. Investigate them early on in your home building planning. Building permits must be posted in a conspicuous place. 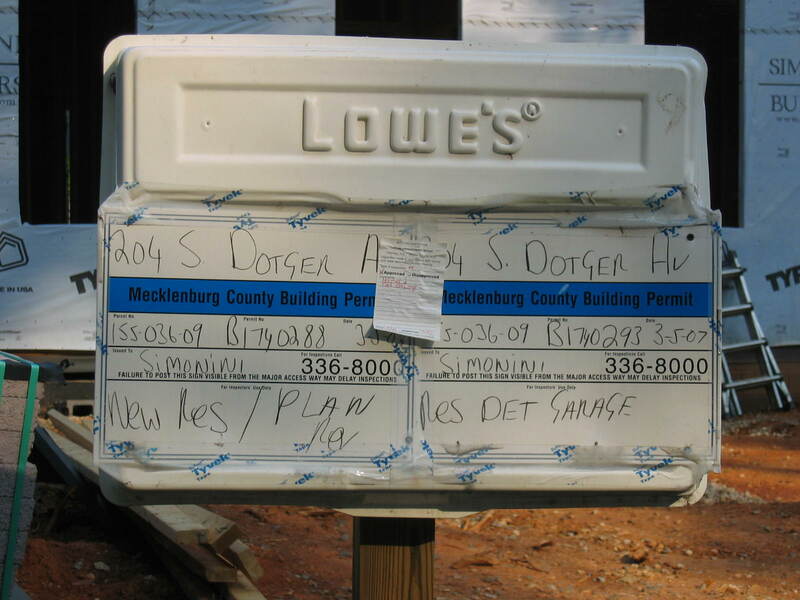 Often, a building supply company will provide a permit display. Having a Plot Plan is a requirement of almost all building authorities before they will issue a building permit. Incorrect house placement is the #1 mistake all builders make! A plot plan is a drawing of the proposed new home on a land survey or boundary survey of your property that shows you and the local building authorities that your proposed new house doesn't violate set-back requirements, straddle easements, or cross property lines. Anyone can draw a plot plan if they already have a survey of their property. Using a registered and insured land surveyor to prepare a plot plan helps assure the correct placement of your new home. And, have a registered, licensed, and insured land surveyor responsible for correct placement of your new home during all phases of your project, such as; if you add a deck, a pool, a fence, an overhang, a garage, etc. As you can see below, this house that I built was a tight fit. My local zoning and deed restrictions both required a minimum of 10ft. clearance from the side property lines and I only had 11 & ½ feet on the right side. The chimney had been planned as an external one, but it had to be moved to the inside wall so that it didn’t violate minimum setback requirements. Note: In most locales, a detached garage can be placed closer to property lines than an attached garage. This allows smaller sized lots to have a garage or a larger garage. 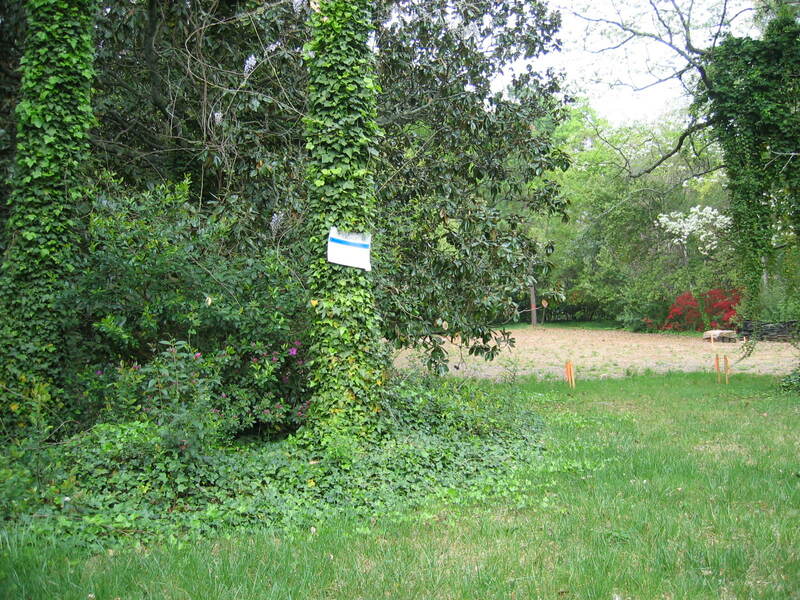 With the assistance of a registered, licensed, and insured land surveyor, determine the placement of your house on your lot based on the plot plan. This is called staking out the house, or house staking.